Many states will not recognize MSO's signed over by just shops. Black with Black Nickel Plating Finish commonly referred to as "Black Chrome". Also fits Chopper/Bobber/Rigid applications using Evolution engine. El Bruto® Series Fully assembled. Ultima 4.25 Bore 127 CI Engine. Black Chrome Nose Cone / Rocker Boxes. Ignition included on this assembled engine. Ultima® is now offering the new El Bruto® Series Engines which are designed to provide our customers with a U. Built High Performance engine that is priced to be the best value of any engines now on the market. Ultimas commitment to engineering excellence and competitive pricing brought El Bruto® to life with a completely new designed set of castings emphasizing performance, reliability, and value. All of the castings in these engines are based on all-new CAD designs cast from C355 aluminum, a common U. Military alloy known for its stability over multiple heat cycles. The engine components are machined on state of the art CNC equipment for guaranteed dimensional accuracy and repeatability. All of our engines are dynamically balanced using proprietary methods to provide the smoothest running engines on the market and now with our new high flow cylinder heads these engines now can boast the most powerful engines on the market as well!! We think that you will agree these engines are the best value anywhere. Cast-in steel inserts guaranteed not to move. Large bore breather for increased crank case vacuum and less blow by. 1/2 Alignment dowels for true line bore. Counterbored stainless allen head case bolts. Made from prime C355-T6 aluminum that is superior in strength to A356. Styling and cosmetic machining for a custom look. Our New state of the art designed crankshaft incorporates a massive 1.670 diameter pin that is pressed into the one piece, heat treated, 4140 steel flywheel half making these crankshafts some of the strongest available on the market today. These crankshafts feature all new 7.7 long H-Beam rods with. 927 diameter wrist pins to handle all the power you can throw at them. These are also balanced using our exclusive methods making these some of the smoothest engines in the industry. Cast in liners will not move. All fins are machined for an excellent cosmetic appearance. All fins are machined for excellent cosmetic appearance. Twin Cam Styling means 30 % more fin than most Evolution® style heads for cooler running. 2.100 stainless intake valves, 1.700 stainless exhaust valves. High silicon wire valve spring with chromoly retainer. 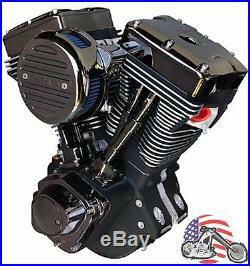 The item "Ultima El Bruto Complete Evolution 127 Black Gem Chrome Motor Engine Harley Evo" is in sale since Thursday, August 4, 2016. This item is in the category "eBay Motors\Parts & Accessories\Motorcycle Parts\Engines & Engine Parts\Other Engines & Engine Parts". The seller is "americanclassicmotors" and is located in Zieglerville, Pennsylvania. This item can be shipped worldwide.